Good news alien hunters! A Kickstarter to fund a year-long investigation into KIC 8462852—the star voted most likely to harbor an advanced alien civilization—just got funded. Alien megastructure or not, we may finally get to the bottom of this bewildering, flickering star. This crowdfunding campaign was set up in May by Yale astronomer Tabby Boyajian, and it managed to meet its $100,000 goal in just 30 days. A $10,000 surge in the last 100 minutes of the campaign managed to put the project over the top. 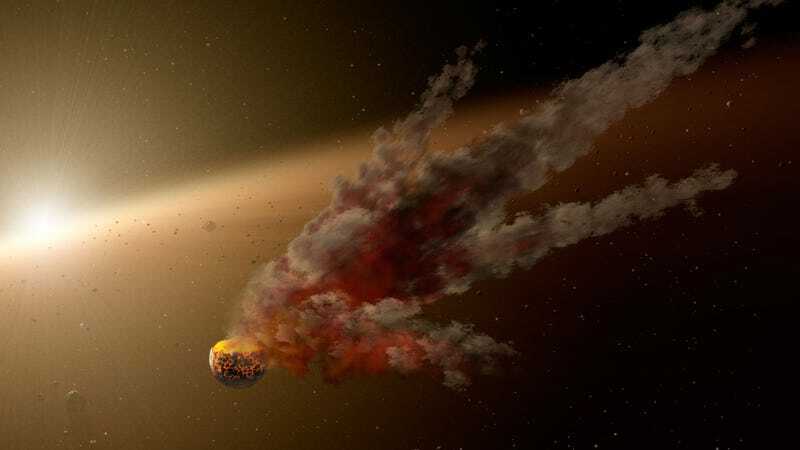 The next step is to figure out the logistics, but Boyajian, who’s been leading the research into KIC 8462852, says observations could start as early as later this summer. The ultimate goal of the project will be to determine why this star’s light dims at such irregular intervals, and at times by as much as 20 percent. These huge dips in luminosity are way too large to be a passing planet, hence the suspicion the anomaly is being caused by swarms of comets, a distorted star, some unknown astronomical phenomenon—or an advanced alien civilization in the process of building a gigantic solar array around the star. Boyajian will now be able to secure year-long access to the Las Cumbres Observatory Global Telescope Network. Should the system spot any further anomalies, an alert will be sent out to other astronomers, who will then turn their own telescopes to the star. The most important thing right now is for astronomers to get more consistent data, and to replicate existing findings. KIC 8462852 was first flagged by citizen scientists who were perusing through troves of data collected by NASA’s Kepler Space Telescope between 2009 and 2013. Some fresh observations—particularly incoming signals in real-time—would be nice. Should new dips in luminosity be detected, astronomers should be able to pick out patterns. Last year, speculation mounted over whether or not KIC 8462852 might be an alien megastructure, perhaps a Dyson sphere. The star is probably not enveloped by a Dyson sphere, but that shouldn’t preclude scientists from looking for signals that may prove or disprove its existence. If this star is being obstructed by a megastructure under construction, it should emit detectable signals in the form of blackbody thermal radiation. The point of a Dyson sphere is to collect solar energy, but leakage is still likely to happen. If a partial Dyson sphere is there, we should still be able to detect it in the form of irregular, but discernable, radiation signatures.